All machines come with a 1 year warranty. WE ARE THE LARGEST WHOLESALER IN THE MIDWEST WITH OVER 1700 MACHINES IN STOCK DAILY!! If you would like to pick up locally or checkout our showroom please call us 937-371-7110. All our machines have gone through a 100 point inspection, machines cleaned, hopper motors re-built, new hopper agitators, pin wheels and knives, new reel motors, old glass panels replaced, pull arm handle mechanism re-built, new lithium battery installed on the computer board, old memory cleared on computer board, lights replaced and much more. 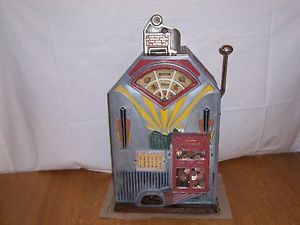 Also per eBay policy on slot machines, we can not sell slot machines which accept coins such as quarters or currency. We can only sell slot machines that accept only game tokens. 8:00 am EST until 4:30 pm EST and on weekends. Slot Machines Unlimited has been in business since 1999. We purchase gaming equipment from casinos and resell them to consumers for home use. We are a small, family-owned business. We have five technicians who work diligently to refurbish the machines. We have three warehouses and carry about 2,500 machines in stock daily. If you purchase a machine from us, we will take care of any problem. We offer a one year warranty on the machine and technical support for all machines purchased through our company. We have been in business for over 16 years and our goal is customer satisfaction. Also, if you have a favorite machine and do not see one on eBay, e-mail us and we will check our inventory and list it on eBay for you. 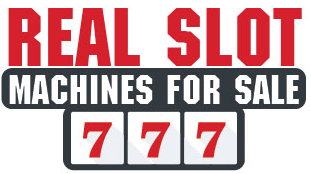 We also have a short videos on how a slot machine works and how to set it up when it arrives. We provide you with instructions needed to make sure your slot machine is running. We have our main slot machine warehouse in Englewood, Ohio. We hold a current registration with the United States Department of Justice (DOJ). This means we are operating a legitimate business with the approval of the government. Be smart and ask for a DOJ certificate. We will gladly fax our DOJ registration papers to you upon request. We know that shopping online is difficult and we are always trying to find ways to take the fear out of it. We send pictures and video of the machine purchased. When you purchase one of our machines, the computer board is set just like it left the factory. Therefore the millions of millions of previous plays are not left on the memory. To the best of my knowledge, no other reseller on eBay does this feature and without it, your machine could be dead in the water a few months after you purchase one. As they say, you get what you pay for. We are an industry leader, providing a one year warranty on parts and labor. We have a staff of five gaming technicians on site to provide technical support, service or parts. Call us for an accurate freight rate quote. 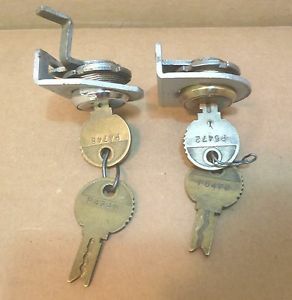 The average delivery charges are from $ 175.00 to $ 250.00 depending on the location. Call or e-mail for our secure Pay Pal account. Should you have any further questions feel free to contact Chris (937)672-7288. 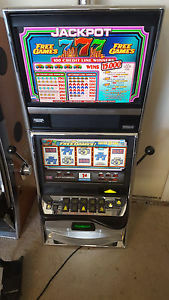 2.Non-coin-operated slot machines: Slot machines that do not accept or pay out coins or currency may be listed on eBay regardless of their age, and buyers from all states may participate in these sales. 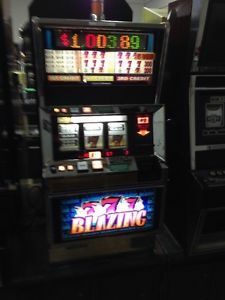 However, slot machines that can be readily converted to use for coins or currency are treated as coin-operated machines and prohibited in Alabama, California, Missouri, New Jersey, New York, North Carolina and Oregon. Therefore, buyers and sellers in those states may not participate in those listings. 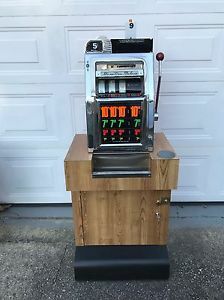 3.Non-functional slot machines: Machines that were never functional but made solely for display may be listed on eBay. In addition, coin-operated slot machines that have been permanently altered so that they will not accept any coin or slot and cannot be converted into an operational slot machine may be listed without restriction.